After 26.2 miles, maybe his new nickname should be Tough Daddy. 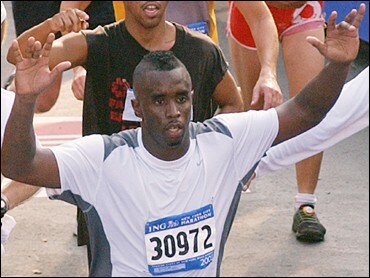 Running on a bum right knee and after just two months of training, hip-hop entrepreneur Sean "P. Diddy" Combs completed the grueling New York City Marathon on Sunday and raised $2 million for children — double what he had planned. "Never in my life have I ever experienced anything as crazy as this," said Combs, who walked gingerly to the podium at a news conference after the race. "It was a beautiful experience." Combs' official race time was 4:14:54, or just under twice the time of winning runner Martin Lel of Kenya, who won in 2:10.30. It was Lel's first marathon win. Women's division winner Margaret Okayo shattered the course record she set in 2001 by nearly two minutes, at 2:22:31. The top American man was Matt Downin, the former New Hampshire runner who starred at the University of Wisconsin, in 17th place in 2:18:48. The best U.S. woman was Sylvia Mosqueda of Los Angeles in 10th place at 2:33:11. The producer-rapper, formerly known as Puff Daddy and Puffy, said he had raised $2 million since announcing in September that he would run. The money will be divided among two children's charities and New York City public schools. Combs ran in sunglasses, his hair in a closely cropped Mohawk and an "I Heart New York" breathing strip across his nose. He was accompanied by police officers and at least one of his employees. He ran into some trouble as the race went on, afflicted by cramps that caused him to walk a few steps. "I definitely wanted to stop," Combs said. "This is definitely a life-changing experience for me because I did not stop." Among his donors: Mayor Michael Bloomberg, who pitched in $10,000; rapper Jay-Z, who gave $25,000; and gossip-column regulars Ben Affleck and Jennifer Lopez, who gave a combined $78,000. Combs, running his first marathon, cut himself a difficult challenge by deciding eight weeks ago to enter the race. He shed about 15 pounds in training and developed severe tendinitis in his right knee. Asked whether he would be back next year, Combs shook his head and smiled: "No, no, no, no, no." But he brushed off suggestions he was only out for personal gain: "Twenty-six miles isn't a publicity stunt." The race, sponsored by financial services company ING, starts on Staten Island and winds through all five New York City boroughs, finishing at Tavern on the Green restaurant in Manhattan's Central Park. Combs was the most publicized entrant in a marathon of more than 30,000, but others were running for their own reasons, or to make their own statements.